Length: The crown-to-rump length almost 2.5 inches (61mm). Length is a better measure at this time than fetal weight. Weight: between 0.3 and 0.5 ounce (8 to 14g). Mother's size: Uterus is growing too large to remain completely within the pelvis. It may now extend above the pubic bone (pubic symphysis) which can be felt on palpitation. Fetal head is about one-half of the crown-to-rump length and rests on a well-defined neck instead of shoulders. Sucking muscles of mouth fill out cheeks, tooth buds continue to develop and salivary glands begin to function. Scalp (hair) pattern is discernible. Heartbeat can be detected with external instruments. Lungs develop further as the fetus inhales and exhales amniotic fluid, which is essential for air sacs within lungs to function properly. Fully functional spleen will assume functions supervised by liver such as removal of old red blood cells and production of antibodies. Sexual organs distinguishing female or male are now clearly visible. 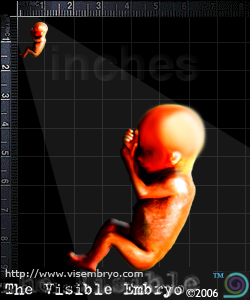 Arms have almost reached final proportion and length, though legs are still quite short relative to fetus' body. Hands, particularly the thumbs, become more functional. Muscles function more smoothly and fetus is more flexible and has advanced movements of head, mouth and lips, arms, wrists, hands, legs, foot, and toes. Muscles and nervous system continue to advance. Sweat glands appear and body hair begins to grow.